Salads are always a healthy choice. The correct answer is myth. Salads are often a healthy choice, but you need to limit high-fat toppings. Creamy dressing, bacon bits, and shredded cheese all add sodium, saturated fat, and calories. Choose salads made with lettuce and a variety of vegetables, and select low-fat or fat-free dressing. Or try making your own salad dressing. On average, Americans eat about half a cup of sugar every day. The correct answer is fact. This adds up to more than 350 calories per day, much higher than what experts recommend. The American Heart Associate recommends that women have no more than 100 calories from added sugar per day and men no more than 150. Cut added sugar from your diet by limiting sugary snacks and soda. To satisfy your sweet tooth, choose sweet fruits instead. The correct answer is myth. Snacks can give you energy in the middle of the day or decrease your hunger in between meals. Enjoy healthy snacks such as fruits, nuts, baby carrots, low-fat yogurt, or string cheese. Any vegetable dish is good for you. The correct answer is myth. Vegetables are healthy. But when they are served fried, breaded, au gratin, or in a creamy sauce, they may be high in sodium, saturated fat, and calories. Choose vegetables that are raw, baked, grilled, or sautéed with a small amount of vegetable oil or low-fat sauce. 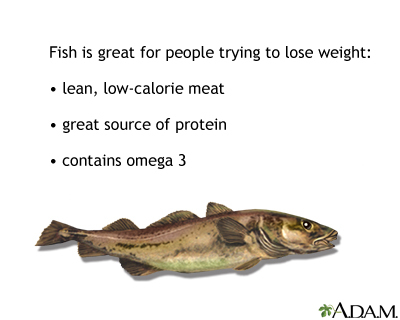 Fish is a healthier option than meat. The correct answer is fact. The healthiest choices are oily fish such as salmon, trout, mackerel, sardines, or albacore tuna, which are high in heart-healthy omega-3 fats. Eating fish a few times a week may help lower your risk of heart disease and stroke. All fats are bad for your heart. The correct answer is myth. Some fats are actually good for heart health. These include the monounsaturated fats found in olive oil, canola oil, peanut oil, nuts, and avocados. Choose these over the saturated fats in butter, lard, palm oil, and cocoa butter. You should avoid overeating grains. The correct answer is fact. Adults should have about 5 to 8 ounces (141 to 226 grams) per day. One half cup brown rice or 1 slice of whole wheat bread is equal to one ounce (28 grams). Grains contain fiber, iron, and vitamins. Whole grains are the healthiest options. Make sure to choose whole grains for at least half of your grain servings each day . Soy products aren't good for you. The correct answer is myth. Soy is rich in fiber, omega-3 fats, and protein. It also contains polyunsaturated fats, which are healthier than the fats in meat. The best sources are tofu, soy milk, and soybeans. The Mediterranean diet is just a fad. The correct answer is myth. The Mediterranean diet is rich in fiber, omega-3 fats, and antioxidants. You can eat a healthier diet by limiting red meats and whole-fat dairy products and eating more olive oil, vegetables, fruits, whole grains, and fish. All fast food is bad for you. The correct answer is myth. While much fast food is unhealthy, it is possible to make healthier choices. If you need to eat on the go, your best bet is to choose places that offer soups, salads, and vegetables. Skip the fries and order smaller servings when possible. This article makes recommendations that can help prevent heart disease and other conditions that can affect the health of your heart. People who currently have a heart condition, such as heart failure, or other health problems, such as diabetes, should talk with their health care provider about what type of diet is best. You may need to make certain changes to your diet that are not included in these recommendations. Fruits and vegetables are part of a heart-healthy diet. They are good sources of fiber, vitamins, and minerals. Most are low in fat, calories, sodium, and cholesterol. 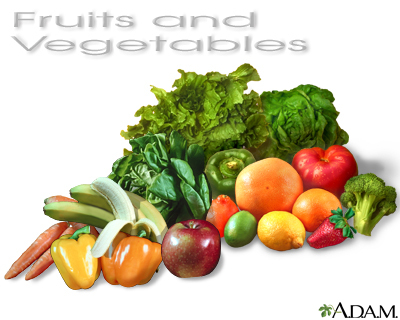 Eat 5 or more servings of fruits and vegetables per day. Get more fiber by eating whole fruits instead of drinking juice. Include whole wheat bread and pasta, brown rice, and starchy vegetables (such as peas, potatoes, corn, winter squash, and lima beans). These foods are high in the B vitamins, iron, and fiber. Choose whole grain foods (such as whole-wheat bread, cereal, crackers, and pasta or brown rice) for at least half of your daily grain intake. Grain products provide fiber, vitamins, minerals, and complex carbohydrates. Eating too many grains, especially refined gain foods (such as white bread, pasta, and baked goods) can cause weight gain. Limit high-fat baked goods such as butter rolls, cheese crackers, and croissants, and cream sauces for pasta. Avoid packaged snacks that contain partially hydrogenated oils or trans fats. Meat, poultry, seafood, dried peas, lentils, nuts, and eggs are good sources of protein, B vitamins, iron, and other vitamins and minerals. Limit high-fat proteins. These include meats such as duck, goose, prime cuts of steak, organ meats such as kidneys and liver, and prepared meats such as sausage, hot dogs, and high-fat lunch meats. Trim off all visible fat before cooking the meat. Eat at least 2 servings of low-mercury fish per week. Cook by baking, broiling, roasting, steaming, boiling, or microwaving instead of deep frying. For the main entree, use less meat or have meatless meals a few times a week. Get protein from plant-based protein foods instead. Use skinless turkey, chicken, fish, or lean red meat to reduce the amount of saturated fat in your diet. Milk and other dairy products are good sources of protein, calcium, the B vitamins niacin and riboflavin, and vitamins A and D. Use skim or 1% milk. Cheese, yogurt, and buttermilk should be low-fat or non-fat. Some types of fat are healthier than others. 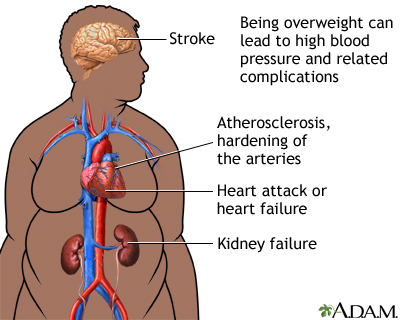 A diet high in saturated and trans fats causes cholesterol to build up in your arteries (blood vessels). This puts you at risk for heart attack, stroke, and other major health problems. Avoid or limit foods that are high in these fats. Polyunsaturated and monounsaturated fats that come from vegetable sources have many health benefits. Limit total fat intake to 25% to 35% of your total daily calories. The American Heart Association recommends eating a healthy diet that limits 5% to 6% of calories from saturated fat. Foods with a lot of saturated fats include animal products such as butter, cheese, whole milk, ice cream, sour cream, lard, and fatty meats such as bacon. Some vegetable oils (coconut, palm, and palm kernel oils) also contain saturated fats. These fats are solid at room temperature. Limit trans fats as much as possible by avoiding hydrogenated or partially hydrogenated fats. These are often found in packaged snacks and solid margarine. Choose soft margarine (tub or liquid) over harder stick forms. Choose margarines with liquid vegetable oil as the first ingredient. Even better, choose "light" margarines that list water as the first ingredient. These are even lower in saturated fat. Read the package label to choose a margarine that does not have trans fats. Trans fatty acids are unhealthy fats that form when vegetable oil undergoes hydrogenation. Trans fats can raise LDL (bad) cholesterol level in your blood. They can also lower your HDL (good) cholesterol level. To avoid trans fats, limit fried foods, commercial baked goods (donuts, cookies, and crackers), and hard margarines. You may find it helpful to talk to a dietitian about your eating choices. The American Heart Association is a good source of information on diet and heart disease. Balance the number of calories you eat with the number you use each day to maintain a healthy body weight. 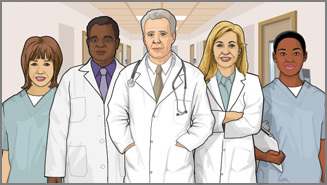 You can ask your doctor or dietitian to help you figure out a good number of calories for you. Limit your intake of foods high in calories or low in nutrition, including foods like soft drinks and candy that contain a lot of sugar. The American Heart Association recommends that sodium intake be no more than 2,300 milligrams (about 1 teaspoon, or 5 mg) a day with an ideal limit of no more than 1,500 mg per day for most adults. Cut down on salt by reducing the amount of salt you add to food when eating and cooking. Also limit packaged foods that have salt added to them, such as canned soups and vegetables, cured meats, and some frozen meals. Always check the nutrition label for the sodium content per serving and be sure to pay attention to the number of servings per container. Season foods with lemon juice, fresh herbs or spices instead. Foods with more than 300 mg of sodium per serving may not fit into a reduced sodium diet. Exercise regularly. For example, walk for at least 30 minutes a day, in blocks of 10 minutes or longer. Try to move at least 30 minutes most, if not all, days of the week. Limit the amount of alcohol you drink. Women should have no more than 1 alcoholic drink per day. Men should not have more than 2 alcoholic drinks each day. One drink is defined as 12 ounces (355 milliliters, mL) of beer, 5 ounces (148 mL) of wine, or a 1 1/2-ounce (44 mL) shot of liquor. Mosca L, Benjamin EJ, Berra K, et al. Effectiveness-based guidelines for cardiovascular disease prevention in women -- 2011 update: a guideline from the American Heart Association. Circulation. 2011;123(11):1243-1262. PMID: 21325087 www.ncbi.nlm.nih.gov/pubmed/21325087. Mozaffarian D. Nutrition and cardiovascular and metabolic disease. In: Mann DL, Zipes DP, Libby P, Bonow RO, Braunwald E, eds. Braunwald's Heart Disease: A Textbook of Cardiovascular Medicine. 10th ed. Philadelphia, PA: Elsevier Saunders; 2015:chap 46. US Food and Drug Administration. Changes to the Nutrition Facts Label. www.fda.gov/Food/GuidanceRegulation/GuidanceDocumentsRegulatoryInformation/LabelingNutrition/ucm385663.htm?utm_source=msn. Updated June 14, 2018. Accessed June 14, 2018. Fish is a great alternative to red meat. Fish is a healthy, lean protein and contains a type of fat called omega three fatty acids, which may help protect the heart. A healthy diet includes adding vegetables and fruit every day. Vegetables like broccoli, green beans, leafy greens, zucchini, cauliflower, cabbage, carrots, and tomatoes are low in calories and high in fiber, vitamins, and minerals. Many studies have shown that eating plenty of vegetables is extremely healthy. Try to eat about 3 to 5 servings every day. Fruit is also a good source of fiber, vitamins, and minerals. You should try to eat about 2 to 3 servings of fruit each day.